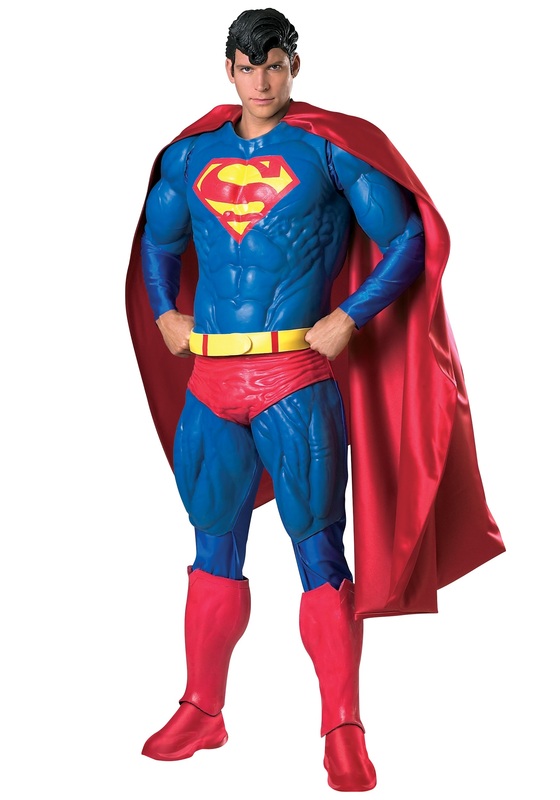 Add this impressive replica Superman costume to your collection! The blue under-shirt and blue tights are 100% polyester and are stretchy for a form-fitting look. The tights have an elastic waist and end in footies. The heavy red cape velcros around the neck and features an embroidered yellow Superman logo on the back. The foam-filled molded latex chest piece has the classic Superman symbol and an outline of Superman's abs. It secures with velcro around the neck and has additional back ties. The two foam biceps pieces fit on the arm with velcro and also can be secured to the chest piece. The Superman trunks feature molded foam thighs in front and Superman's iconic red underpants. The rear is stretchy blue polyester. The red boot covers are also molded foam. The yellow latex belt secures with velcro. The molded latex headpiece is styled like Superman's black hair with front cowlick. Save the world as the iconic Superman with this collectors edition costume.